Wave Glider autonomous surface vehicle. Why do we need a hot spot at sea? Oceanographic research is reliant on real-time data to track and respond to rapidly evolving environments. Real-time data help scientists make informed decisions such as determining where to send a limited number of AUVs or what samples to take once the AUVs arrive. MBARI uses the Oceanographic Decision Support System to track real-time changes in the Monterey Bay in order to plan complex experiments like the CANON expeditions. By understanding the actual and immediate conditions of the Monterey Bay, scientists can choose the best locations for sampling or hone in on dynamically changing areas. 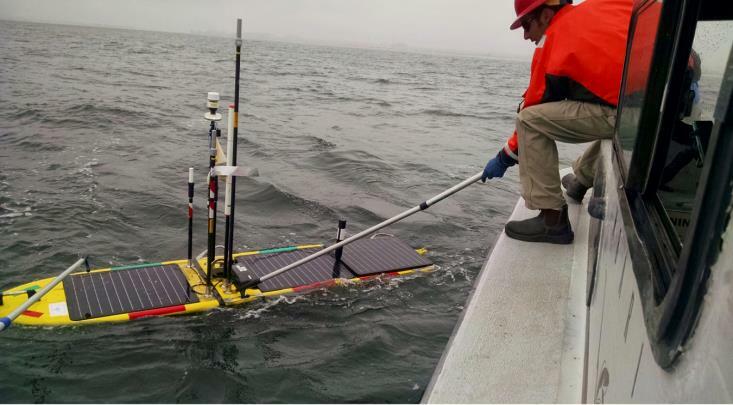 However, to send data back to shore, AUVs must surface to establish a satellite or cellular connection because radio waves (Wi-Fi, FM, or cellular) cannot propagate through seawater. Mobile phone networks are ubiquitous on land, with fairly cheap and fast links, but the AUV must be within about 15 kilometers of a cell tower to get a connection. Surface-to-satellite connections provide worldwide coverage, but are expensive and transfer data slowly, meaning the AUV spends long periods on the ocean surface while the modem consumes valuable power. A Wave Glider can be at sea for several weeks at a time at very low operational cost, a benefit in comparison to using a crewed ship to monitor deployed vehicles and instruments . A Wave Glider Hot Spot is deployed off the R/V Paragon. The Wave Glider Hot Spot is able to navigate autonomously and carries several types of modems, ranging from acoustic to satellite. The Hot Spot acts as a communication relay by retransmitting information received on one modem link to another link, e.g. by transferring AUV data received on an acoustic link to shore via satellite. Unlike radio waves, sound can propagate through the ocean and allow information to be sent to nearby underwater and surface vehicles. An AUV or seafloor instrument package with a compatible modem can send collected data to a nearby Wave Glider, which can transfer the data to shore via radio. The range between the Wave Glider and underwater target can be calculated by measuring the travel time of the acoustic signal; several ranges can be taken from various locations to “triangulate” the target’s position. 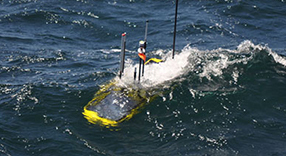 In addition the Wave Glider can carry a special modem called an ultra-short base line (USBL) system; this device can determine the range, azimuth, and elevation to the target. Exchanging data acoustically is a slow process however, so the Wave Glider Hot Spot also carries a Wi-Fi modem. If an AUV is within a few hundred meters of the Wave Glider Hot Spot, the AUV can surface to transfer larger loads of data much more quickly using Wi-Fi. While the AUV must still surface, it spends much less time and power transferring information and can return more quickly to its underwater mission. If the Wave Glider is within range of a cell phone tower, it can send information via a cellular network, just like a cell phone. This is both faster and cheaper than relying on a satellite connection, which is used in case the Wave Glider is out of range of any other form of communication. This variety of communication links provides an “interactive console,” allowing shore-based users to log into the hot spot and, from there, the other vehicles and sensors. The user can perform manual data retrieval, system reconfiguration, troubleshooting, and other tasks, without the need for a ship or physical recovery. Eventually, the interactions between the Wave Glider Hot Spot and the deployed AUVs and seafloor sensors will also become sophisticated enough for adaptive sampling. A sensor on one AUV may trigger additional sensors on it, as well as pass a message back to the Hot Spot. The Hot Spot may then trigger relevant sensors on neighboring AUVs or seafloor instruments. Where is the Wave Glider Hot Spot being used? So far, the Hot Spot has been used in several projects. It provided acoustic communication support to the Coordinated Canyon Experiment to provide timely characterization of multiple turbidity events, as well as to make remote repairs to the deployed software in 2016. The Hot Spot provided acoustic communication and geolocation support to the Benthic Rover (part of Ken Smith’s Pelagic Benthic Carbon Coupling project). The Hot Spot utilized automated geolocation algorithms developed by our collaborator Ivan Masmitja on three occasions in 2016, to track Rover location progress with high accuracy on the seafloor at Station M, at 4,000 meters depth. The Hot Spot was also used during the 2016 spring CANON campaign to allow scientists aboard the R/V Rachel Carson to monitor a coastal profiling float and take water samples from the same volume of water. When the float failed to rise to the surface as expected, the Hot Spot was able to locate the float using acoustic information and an algorithm developed by MBARI collaborator Ivan Masmitja. The float was found at 630 meters depth, where it had flooded and sunk, and was recovered by the ROV Ventana crew thanks to the precise coordinates provided by the Hot Spot. During a Lagrangian drift sampling experiment carried out in 2014-2015, the Wave Glider Hot Spot and profiling long-range AUV (LRAUV) acoustically determined location of LRAUV drifting at the thermocline, and followed and circled it. All three vehicles carried science sensors to measure CTD (conductivity, temperature, depth), fluorescence, backscatter, and dissolved oxygen. 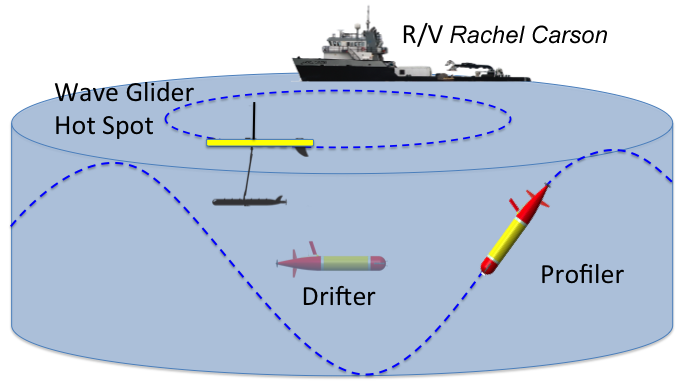 The R/V Rachel Carson periodically visited the drifting water mass to take samples for genomic/microscopic/isotopic analysis, and used Wave Glider surface location to locate the patch to be sampled. 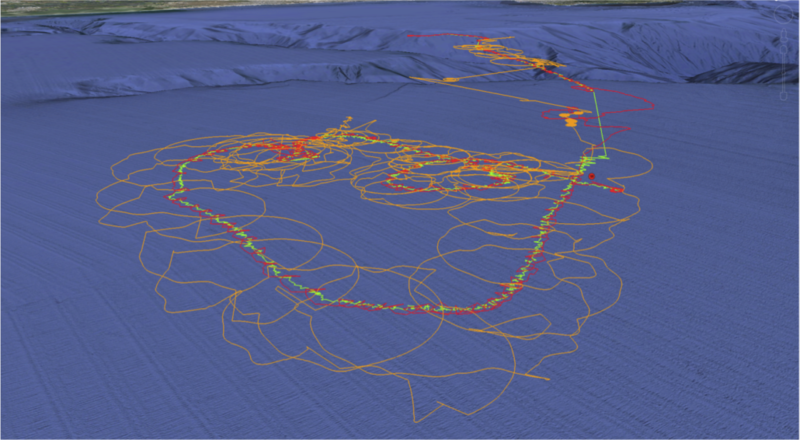 Tracks of the drifting LRAUV (green), profiling LRAUV (orange), and Wave Glider Hot Spot (red) over a 48-hour period in October 2014. 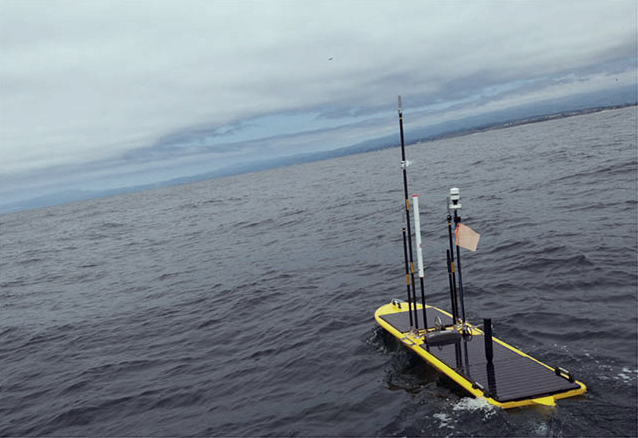 The Wave Glider is an autonomous surface vehicle produced by Liquid Robotics and purchased and outfitted with sensors and communications gear by MBARI engineering. Masmitjà, I., S. Gomariz, J. Del Rio, B. Kieft, and T. O’Reilly (2016). Range-only benthic rover localization off the central California coast. Instrumentation Viewpoint, 19: 86-87. Masmitjà, I., S. Gomáriz, J. del Rio, B. Kieft, and T. O’Reilly (2016). Range-only underwater target localization: Path characterization. In: Marine Technology Society / Institute of Electrical and Electronics Engineers Oceans Conference, Monterey, 1-7. Masmitjà , I., O. Pallarés, S. Gomáriz, J. del Río, T. O’Reilly, and B. Kieft (2016). Range-only underwater target localization: Error characterization. In: 21st IMEKO TC4 International Symposium and 19th International Workshop on ADC Modelling and Testing Understanding the World through Electrical and Electronic Measurement, Budapest, Hungary, 267-271.